Abstract: Because of the huge number of glyphs involved, Chinese character memorization is a very challenging topic, even for native speakers. Several pedagogical methods have been proposed for foreign learners, yet they often end up in a long list of characters rather hard to process. Our approach is different: Chinese characters are considered from a logical point of view, later extended to an algebraic one. To this aim, we have first formally defined the relations possibly existing between any two such characters, for example is radical of and is contained by. Hence, a set of characters induces a network (see Figure, one color per relation type, e.g. green for is radical of). 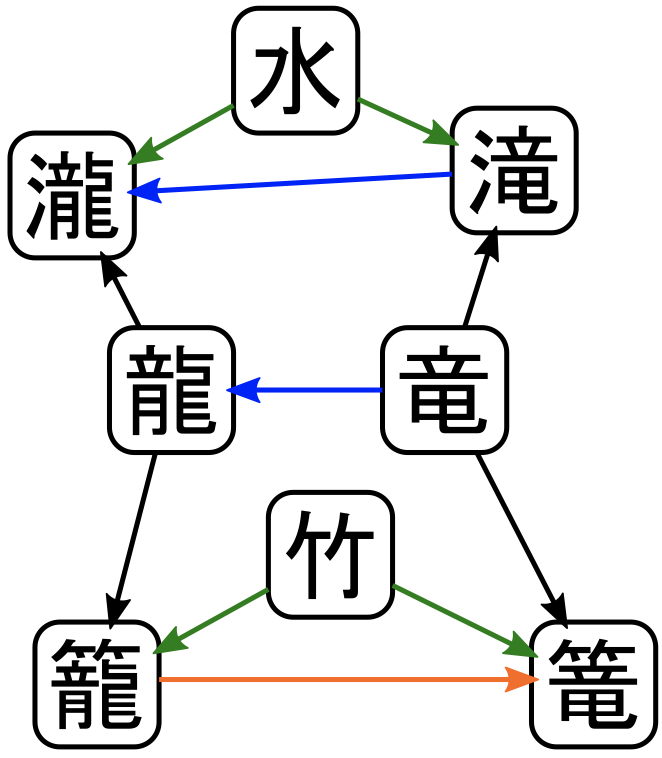 After extending such approach to a character algebra for facilitated character description and manipulation, we have conducted an ontological analysis of Chinese characters, thus producing a character model which allows for various information science applications. 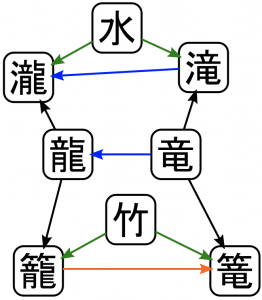 For instance, we have described a novel input method editor (IME) for Chinese characters. In this talk, we will review the motivations and overall progression of this research, the challenges encountered, eventually giving an insight on possible future developments and applications. Bio: Antoine Bossard is an Associate Professor of the Graduate School of Science, Kanagawa University (Japan). He received the B.E. and M.E. degrees from Université de Caen Basse-Normandie, France in 2005 and 2007, respectively, and the Ph.D. degree from Tokyo University of Agriculture and Technology, Japan in 2011. His research is focused on graph theory, parallel and distributed computing and interconnection networks, addressing issues such as routing and fault-tolerance. For several years, he has also been conducting research regarding Japanese characters and their memorization. He is the author of multiple peer-reviewed publications in these fields. Antoine is a member of ACM and ISCA, and is involved in the organization of several international conferences. Abstract: With the advance of sensing, actuation and wearable technology, Internet of Things (IoT) has become the next IT research focus. Many IT companies have started to invest heavily into this area by developing and inventing innovative IoT products. We have developed a flexible IoT platform and middleware, called WuKong, to support the development of new IoT applications. The WuKong middleware supports the flow-based programming (FBP) paradigm for users to define data and control workflows among virtual, conceptual sensing classes. Users can also specify simple execution policies on when, where, and how an FBP should run in a user’s environment. The WuKong middleware can intelligently decide how to deploy an IoT application by mapping an FBP to physical devices in order to meet the functionality requirements. We have designed smart building applications using “evacuation sensors” that can guide people to find safe exit paths when fires are detected in a building. We have also built smart drones designed to detect and lead human from dangerous areas. Algorithms and techniques can be integrated for real time detection of dangerous events and situations. Combined with data analytics, evacuation sensing can make predictions on dangerous areas for people to avoid. In this talk, the issues, techniques and challenges for evacuation sensing will be discussed. Bio: Kwei-Jay Lin is a Professor at the University of California, Irvine, USA and Nagoya Institute of Technology, Japan. He is the Chief Scientist of the NTU IoX Research Center at the National Taiwan University. He is also an Adjunct Professor at the National Taiwan University and National Tsinghua University, Taiwan, Zhejiang University, China. He was an Associate Professor at the University of Illinois, Urbana-Champaign 1985-1993. He was a Visiting Research Fellow at the Academia Sinica, Taiwan in Spring 2016. Prof. Lin is an IEEE Fellow, and Editor-In- Chief of the Springer Journal on Service-Oriented Computing and Applications (SOCA). He was the Co-Chair of the IEEE Technical Committee on Business Informatics and Systems (TCBIS) until 2012. He was an Associate Editor of IEEE Transactions on Parallel and Distributed Systems, 2002-2006, and an Associate Editor of IEEE Transactions on Computers, 1996-2000. He was the External Examiner for the Hong Kong University’s Program on E-Commerce and Internet Computing during 2006-2009. Prof. Lin has published more than 200 papers in journals and conferences. He has served on many international conferences, recently as PC-chair of IEEE SOCA 2017 and conference co-chair of CBI 2015. He has given keynote speeches in the 22nd IEEE Conference on Embedded and Real-Time Computing Systems and Applications in August 2016, the 6th IEEE Symposium on Cloud and Service Computing, in December 2016, and the 11th IEEE International Symposium on Service-Oriented System Engineering, in April 2017. His research interest includes service-oriented systems, intelligent IoT applications, middleware and kernel, real-time computing, and distributed computing. Abstract: As the foundation for MapReduce processing, Hadoop is one of the fundamental technologies in big data analytics. Hadoop breaks up large data into data blocks, replicates them, and stores them in a distributed storage system. Data blocks can be placed in a machine where the data will be processed (data local), in a machine in the same rack (rack-local), or in a machine in a different rack (off-rack). As the location of a data block gets farther from the processing node, a higher data transfer overhead is incurred. Therefore, the location of a data block can significantly influence the performance of MapReduce processing. The data locality problem has been approached in many ways including, scheduling, data placement, networking, partition/key, and framework. While the majority of the data locality improvement effort is concentrated in the early stages of MapReduce, it is possible to extend it to later stages. These approaches are called Shallow Data Locality (SDL) and Deep Data Locality (DDL) respectively. DDL can be achieved in two ways: pre-arrangement of the data blocks in a way to reduce data movement, and/or micromanipulation of the data within the data blocks. It has been shown that DDL can improve the performance of MapReduce in certain applications. This talk will introduce the concept of Hadoop data locality, its impact on MapReduce performance, and past approaches to improve data locality. The process of DDL, the analytical models and simulation results, and the experimental results with common benchmarking tools will also be presented. Bio: Ju-Yeon Jo is currently an Associate Professor in the Department of Computer Science at the University of Nevada Las Vegas (UNLV). She has worked in cybersecurity, computer networks, software engineering, and big data analytics, both in industry and academia. Before joining UNLV, Prof. Jo was a Member of Technical Staff at Bell Laboratories of Lucent Technologies, Holmdel, New Jersey, where she developed control software for optical networking equipment. She also worked as a software engineer at Coree Networks, a start-up that developed an ultra-fast packet switch. Her academic work includes research on real-time control software design and testing, network performance analysis, various cyber attack protection methods, data collection and visualization, cybersecurity data mining, and performance issues of Hadoop and MapReduce. She has served numerous IEEE and other conferences as a program, conference, finance, registration, and local chair. She received her Ph.D. from Case Western Reserve University in Cleveland, Ohio in 2003.